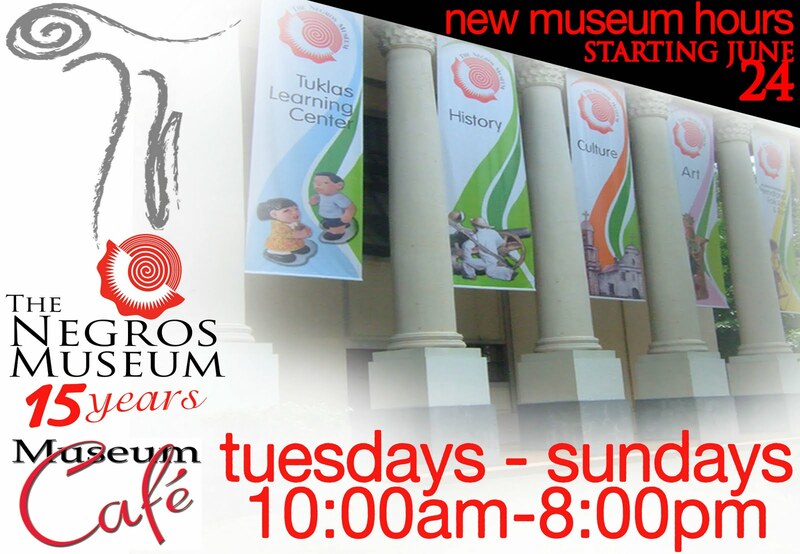 The Negros Museum will open from Tuesdays to Sundays from 10AM-8PM starting next Friday, June 24, 2011. TNM Executive Director Tanya Lopez encourages everyone especially the working sector and their families to visit the Museum and attend its different events after work and on weekends. The extended hours hope to give room for other interested Negrenses and guests to enjoy the Museum, its exhibits and galleries. 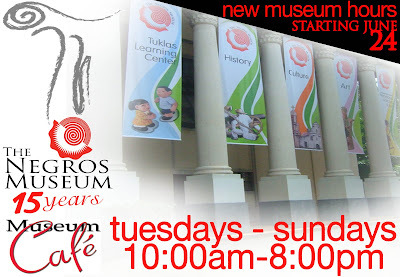 June 24, 2011 will also mark the re-opening of the Museum Café with a unique menu of natural artisan culinary art highlighting Negros’ natural and locally grown food like coffee from La Granja. The Café can also sit more than 50 people where one can enjoy either PHINMA Main Gallery’s art exhibits or the exterior grounds with Raymond Legaspi ‘s mural “Hacienda Unwind”.